A downlink message comprehends the last mile in the IoT communication cycle, it enables devices, connected to the application layer through protocols requiring intermediary platforms, to be controlled or setup-modified from afar. Such an example are devices using LoRaWAN communication protocol and The Things Network, TTN, as a network server. TTN provides an API triggered by POST request to forward messages from the cloud down to devices, that is, downlink messages. 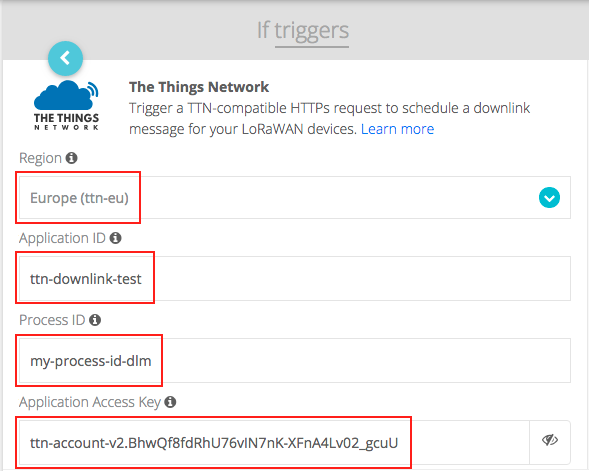 Following this guide, you will be able to send messages from Ubidots platform to a TTN-connected device using the events module and TTN downlink API. A Control variable within your device in Ubidots to trigger the downlink event. 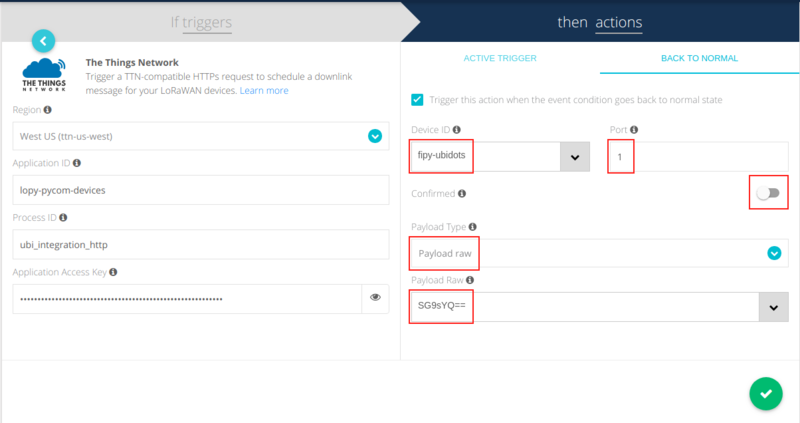 The below steps indicate how to create an event in Ubidots to perform a downlink message to the TTN back-end, and hence control devices from Ubidots UI. Step 1: Open Events module located under the Data dropdown. Step 2: Create a new event and setup the condition to be triggered upon based on the control variable values. Step 3: Next, in the Actions section, create a "TTN downlink" action. Step 4: Head to your TTN console and select the application hosting the device you want to make a downlink to. Region: The zone where your TTN app belongs to. Application Access Key: found at the bottom of the Application overview. Process ID: found on the integration tab, corresponds to the integration ID used to send data to Ubidots. IMPORTANT NOTE: for downlink purposes, HTTP integration is required. 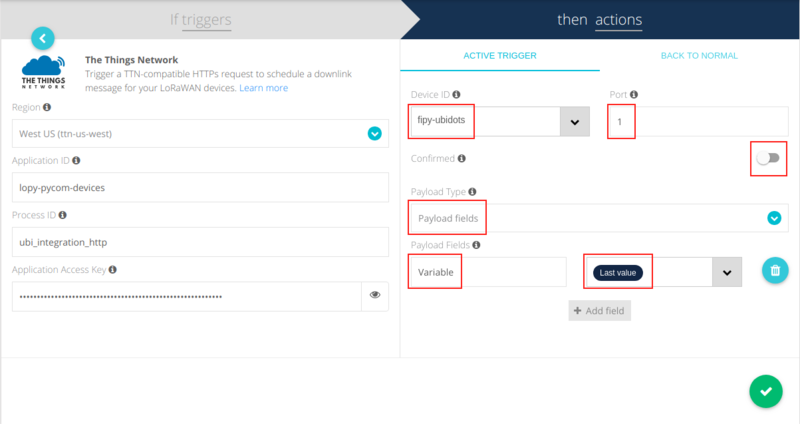 Device ID: correspond to the unique identifier assign when the device is created in the TTN application. Port: the port through which the device is communicating to TTN. This is found in the device's details by scrolling down. Confirmed: Whether the downlink should be confirmed by the LoRaWAN device. Payload Type: Use "raw payload" to send binary data, or "payload fields" if your TTN application has an encoder payload function to encode JSON to binary. Raw Payload: Base64 encoded payload. Step 8: Set the "Back to normal" option if required, just the same as in Step 5 . This will trigger a second downlink message once the event condition is no longer true. Payload Fields: SG9sYQ== (means "hola" – hello in Spanish). Step 9: Follow up to the last step in the event creation, name it, defined day and hour active windows and save it. After setting up your downlink event to be triggered once a condition es met, you should see something similar to the below GIF in your TTN application Data tab.